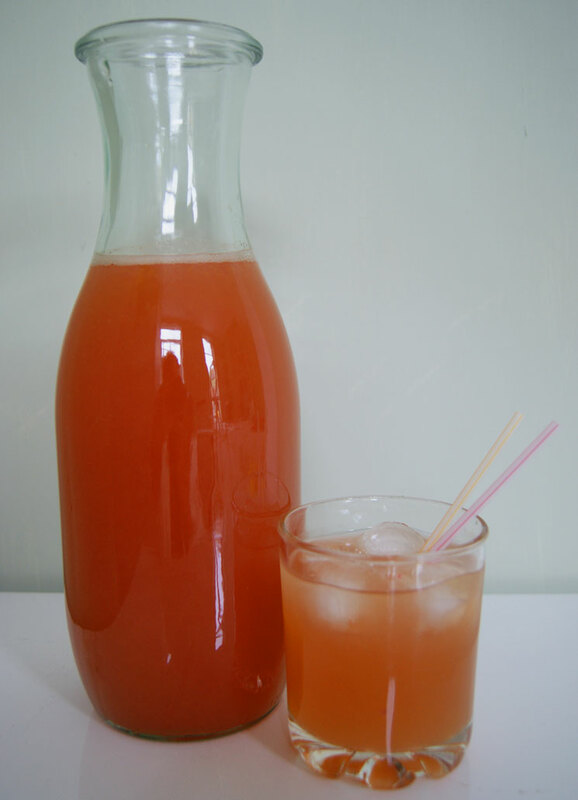 Making fresh fruit drinks is one of the joys of summer; on a warm day nothing tastes quite as good as a cold glass of lemonade or, in this case, pink grapefruit-ade spiked with ginger syrup. Not only is it pretty and bang-on-trend coral pink but it has a delicate, refreshing flavour which is a lovely pick-me-up after a day spent outside in the sun. It’s also a fab alcohol-free drink to offer your designated-driver guests; it makes a refreshing (haha) change from Coke and J2O. When life gives you lemons, make lemonade. 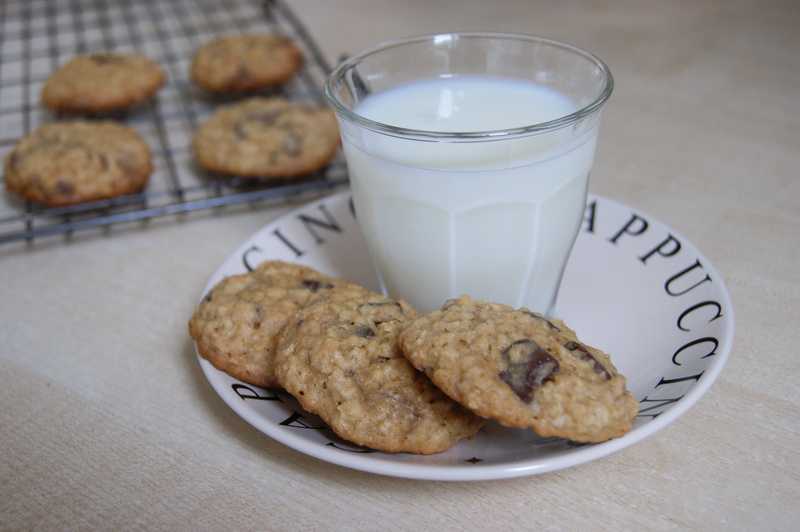 When life gives you crystalised ginger, make these cookies. And when you’re having a particularly lemony day all you need to do grab a few dough balls from the freezer and bung them in the oven. In a mere 15 minutes you’ll be in spicey, chocolatey nirvana. Aye up! Last week we escaped to a little cottage on the edge of Yorkshire and the Peak district. We replaced the rolling green hills and thatch of Devon with rugged, heathery peaks and pretty villages built from yellow-cream stone. Yorkshire has a flourishing food scene and we happened upon several excellent farmers’ markets and food festivals. The pubs within walking distance of our cottage all served the most delicious, local grub and ales; I feel like I’ve put on about a stone in weight! So no surprise that I wanted to stave off the post-holiday blues and recreate a little bit of ‘up North’ at home. Every year in July we celebrate my husband’s birthday by hosting a barbecue for our friends. Come rain or shine we sit out in the garden enjoying burgers, sausages and cold beers as well as occasionally throwing Maltesers, singing stupid songs and sending toy hamsters through ‘the ring of fire’. Every year I ask my other half what kind of birthday cake he would like and every year the answer is cheesecake. We’ve seen double chocolate, dulce de leche and tiramisù versions come and go but last year’s cake seems set to stay. Inspired by a dessert he had at a Mexican restaurant well over a year and a half ago, once again the request was made for lime cheesecake with a spicy ginger crust. 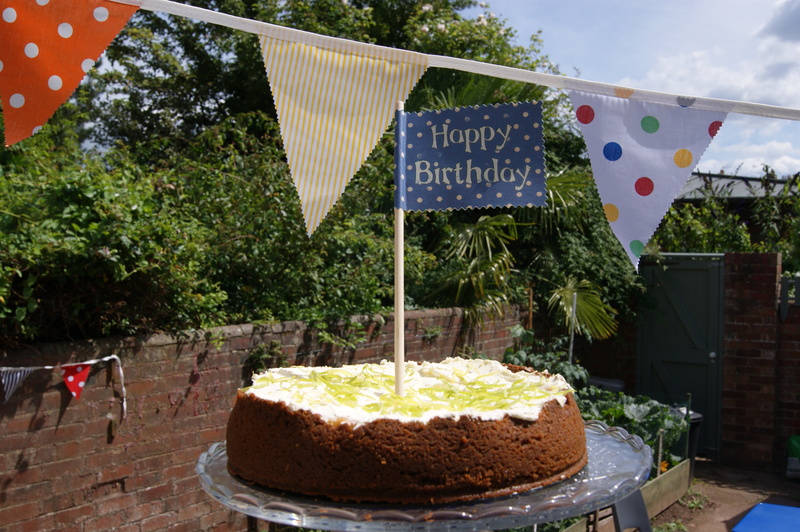 To lift it from the realms of delicious dessert to birthday-worthy celebration cake it is topped with a cloud of whipped cream, curls of lime zest and a cute flag I found in my favourite card shop. We’ve just celebrated Chinese New Year and World Nutella Day. Now Valentines Day is just around the corner. Cue more face-stuffing, this time in the name of romance. Please excuse my rather jaded tone, I don’t have anything against romance or taking some time out to celebrate a relationship, I just don’t really do Valentines. This probably goes back to my school days where I was the shy, geeky girl in the corner who always wanted a card and never got one, but this really isn’t the venue for that particular conversation. Now I’m happily married, my husband and I treat February 14th as any other day except there’s steak for dinner. Oh, and probably dessert. Hmm, maybe I do ‘do’ Valentines? I’m sure plenty of folks out there will be staying in for dinner, maybe celebrating as a couple, maybe having a family dinner, maybe indulging in a little ‘me’ time. This week I will try to provide you a few different sweet ideas suitable for a Valentine’s evening. First up a scrummy cheesecake-style tart, that will feed up to six, with a peppery ginger base, smooth, creamy mascarpone filling and sweet, juicy vanilla-poached pears on top. Don’t be put off by the long recipe, this is a low-effort dessert, but do allow time for the various elements to cool and make sure the tart is chilled before serving. 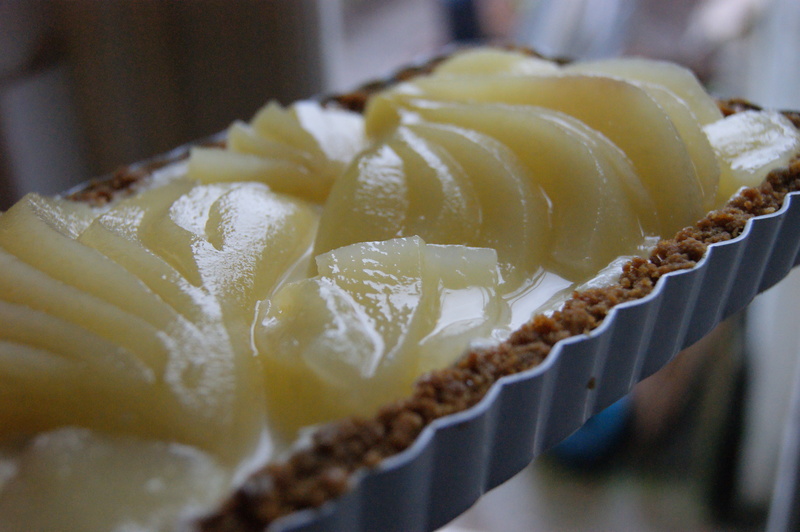 Heat the oven to 180°C and butter a 9″ (23 cm) round* loose-based tart tin. In a food processor or with a zip-loc bag and a rolling pin, smash the ginger snaps into fine crumbs. Sitr in the melted butter and line the tin. A cold metal measuring cup or small pan will help make a nice neat corner between the base and the sides. Bake for 8 minutes until the colour darkens but is not burnt. Leave to cool. In a large bowl beat together the filling ingredients until smooth, taste and add more sugar, lemon zest or vanilla if you think it needs it. (Save the the lemon for poaching the pears). Spread evenly over the cool base and chill. 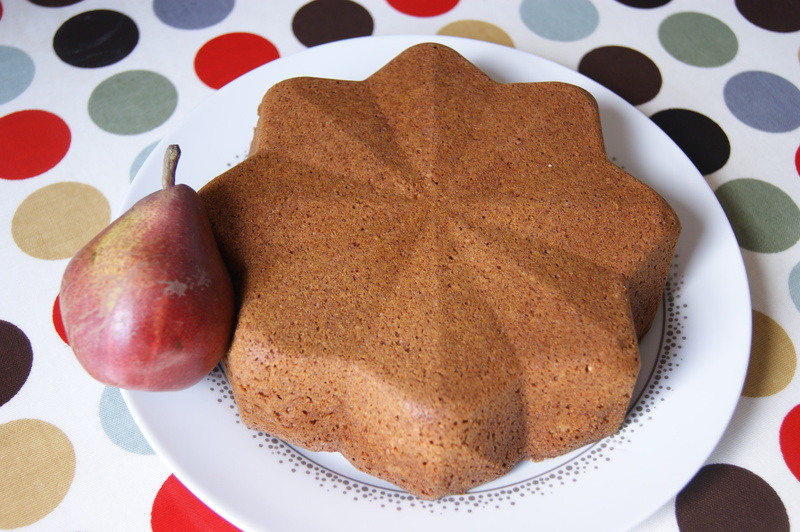 To poach the pears, put the water and sugar in a medium pan and heat until the sugar disolves. Add the vanilla pods split in two and the lemon cut in half. 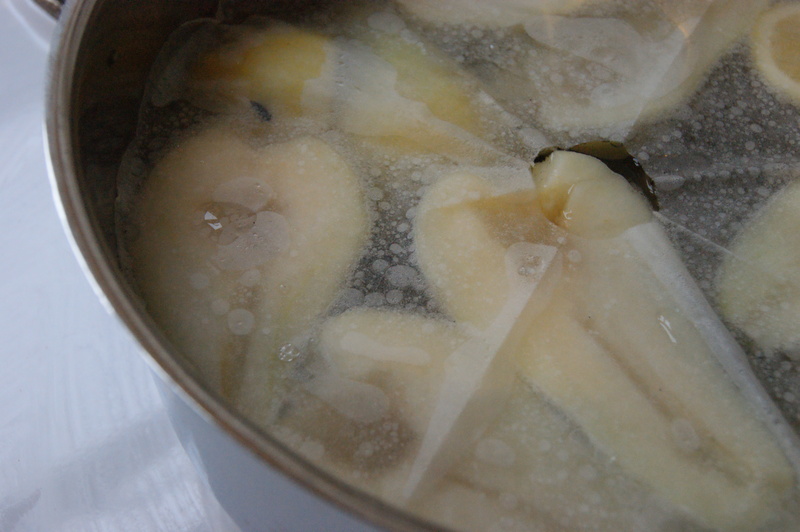 Prepare the pears – peel and slice in half lenthways, remove the core with a knife and place in the poaching liquid**. Cut out a circle of baking paper the size of the pan and cut a small circle in the middle, place over the pears and simmer gently for 15 minutes. Take the pears off the heat and allow to cool in the liquid. Once cool, slice or cut into a fan shape and arrange on top of the cheesecake. 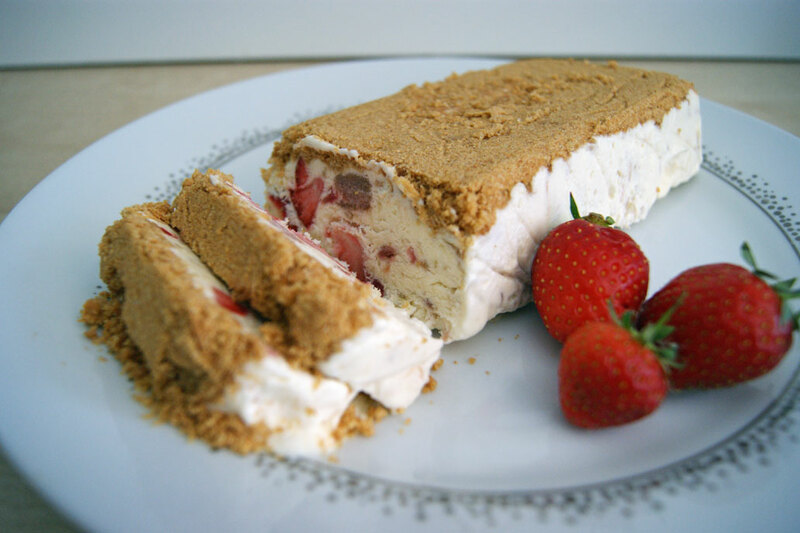 The cheese cake can then be served or stored in the fridge for several hours. *Or in my case, a rectangular 14″ x 5″ (35 x 12cm) tin. **You can poach an extra few pears in this volume of liquid; they’re good for breakfast.